[email protected]: Just arrived in Wisconsin to help two great people, @ScottWalker and @LeahVukmir. [email protected]: "We are extremely angry, upset, unhappy about what we witnessed this morning and we will get to the bottom of it." [email protected]: "The full weight of our government is being deployed to conduct this investigation and bring those responsible for these despicable acts to justice." 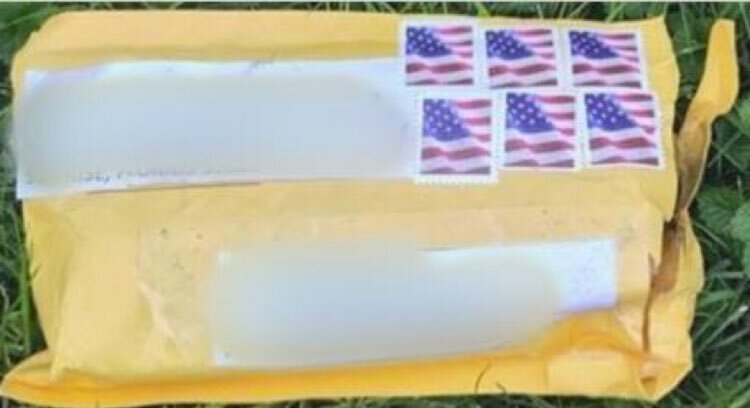 DC Police: Multiple packages containing possible explosive devices, similar to the one pictured below, have been located in NY and DC. If you see any suspicious activity similar to these incidents, please do not hesitate to call 911. 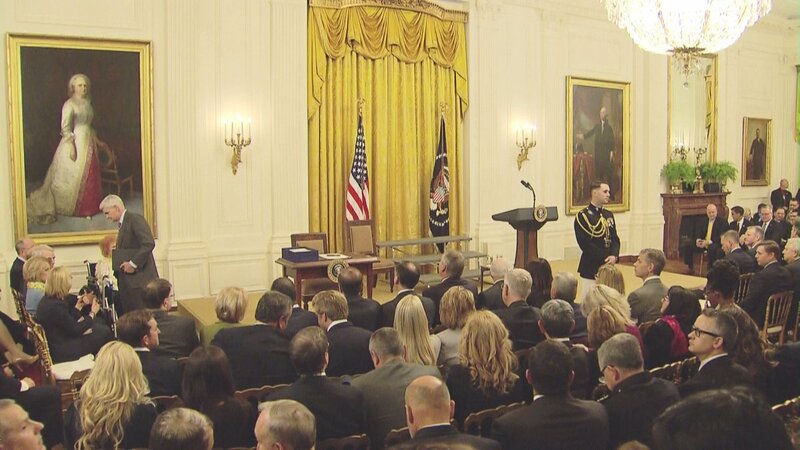 President Trump - "The safety of the American people is my highest priority," says packages are being investigated "as we speak"
Guests gathered in East Room for @POTUS signing event of Opioid Recovery and Treatment Bill, passed by significantly bipartisan margins: 99-1 in the Senate, 396-14 in the House. 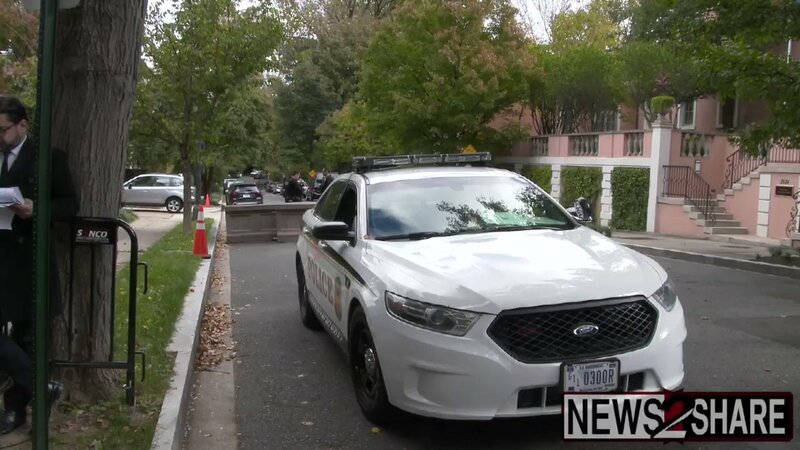 Raw footage: The scene outside the Obama residency in DC is pretty quiet. 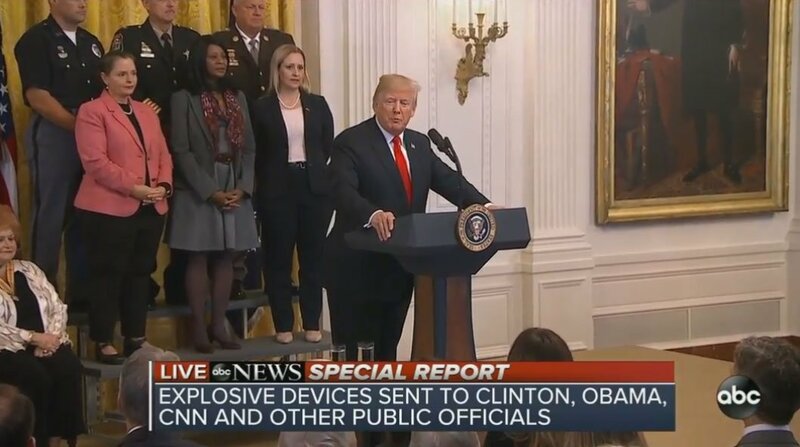 The reported pipe bomb was intercepted before arriving, Obama family never in danger. Secret Service keeping press back at least 150 feet from the house. Sarah Sanders:This is an ongoing situation that President Trump and his admin are monitoring closely. 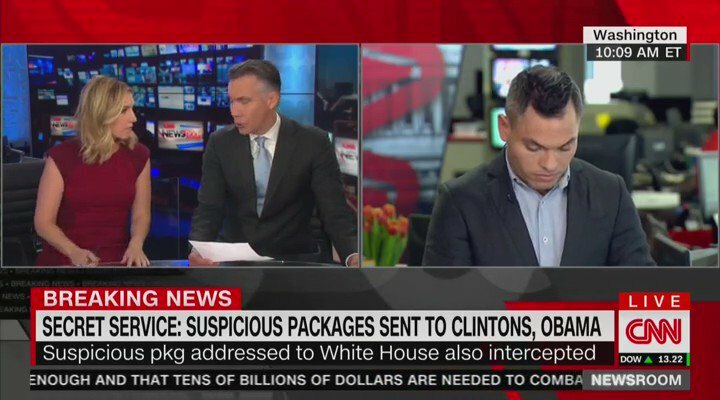 Our condemnation of these dispicable acts certainly includes threats made to CNN as well as current or former public servants. These cowardly acts are unacceptable and wont be tolerated. 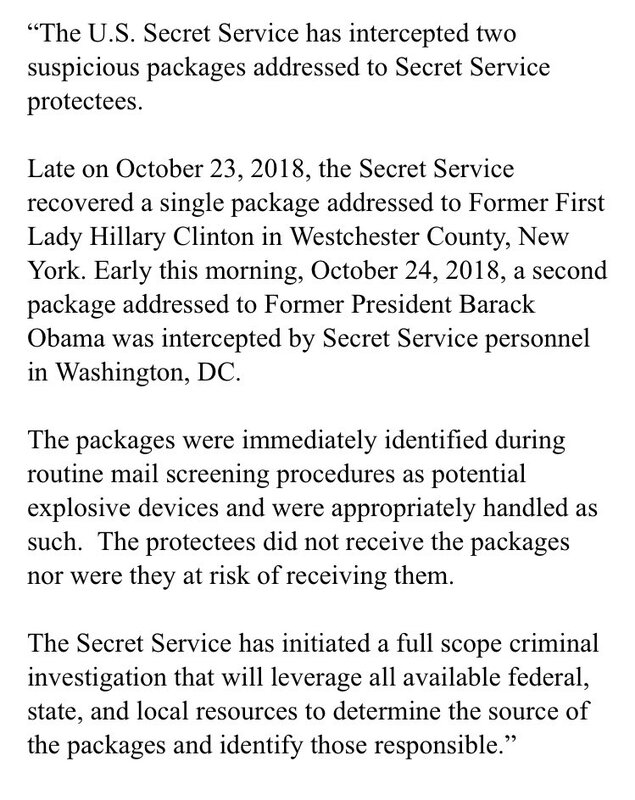 USSS: "Reports of a third intercepted package addressed to the WH are incorrect." 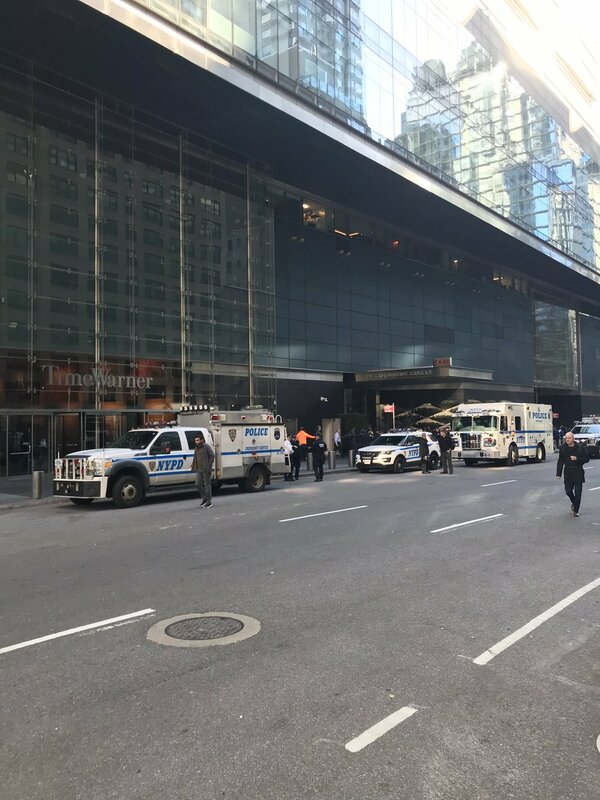 Scene outside CNN NY HQ right now. NYPD Bomb squad here. "The United States Secret Service and other law enforcement agencies are investigating and will take all appropriate actions to protect anyone threatened by these cowards," says @PressSec. 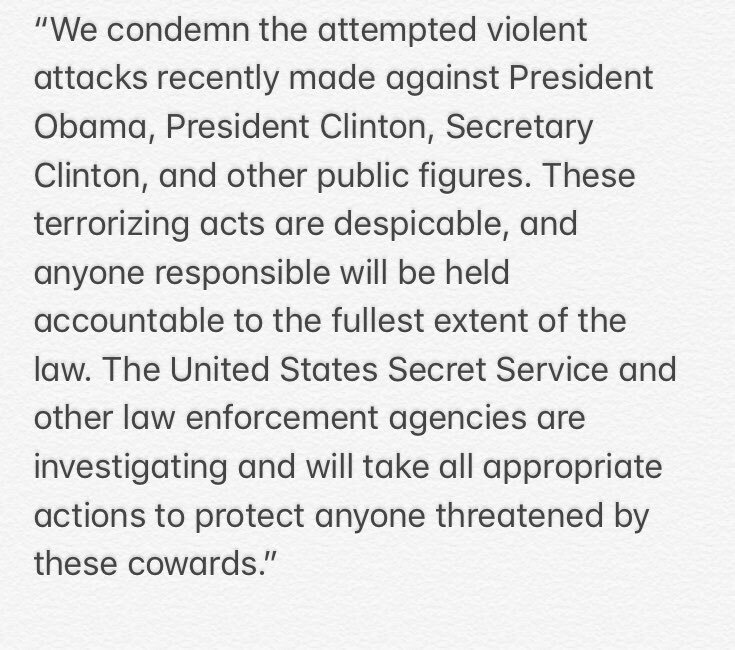 "We condemn the attempted violent attacks recently made against President Obama, President Clinton, Secretary Clinton, and other public figures," says @PressSec. Just in from Sarah Sanders @PressSec: "These terrorizing acts are despicable, and anyone responsible will be held accountable to the fullest extent of the law." [email protected]: Republicans will totally protect people with Pre-Existing Conditions, Democrats will not. Vote Republican. [email protected]: Brian Kemp will be a GREAT Governor of Georgia. Stacey Abrams will destroy the State. Sooooo important, get out and VOTE for Brian. [email protected]: We are a great Sovereign Nation. We have Strong Borders and will never accept people coming into our Country illegally. [email protected]: For those who want and advocate for illegal immigration, just take a good look at what has happened to Europe over the last 5 years. A total mess. They only wish they had that decision to make over again. [email protected]: I agree with President Obama 100%. President Trump: Effort to conceal the killing of Jamal Khashoggi at the Saudi consulate was the "worst cover up ever." 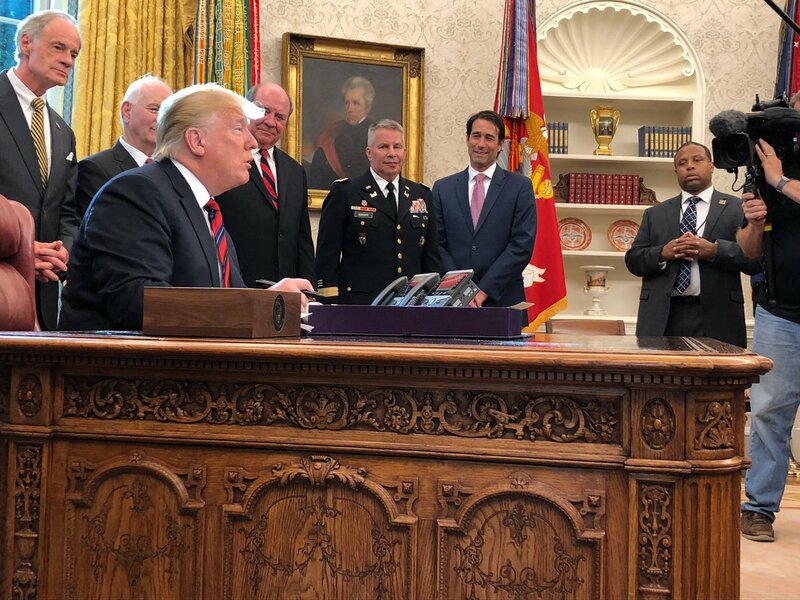 During a 39-minute session in the Oval Office with reporters present, @POTUS said "we may" meet with Russia President Putin in Paris, saying his advisers overseas were working that out. "I think something good could come out of that," he added. [email protected]: Billions of dollars are, and will be, coming into United States coffers because of Tariffs. Great also for negotiations - if a country won't give us a fair Trade Deal, we will institute Tariffs on them. Used or not, jobs and businesses will be created. U.S. respected again. [email protected]: Congressman John Faso of New York has worked hard and smart. Strong on Crime, Borders and our 2nd Amendment, John is respected by all. Vote for John. He has my complete and total Endorsement. [email protected]: The people of Puerto Rico are wonderful but the inept politicians are trying to use the massive and ridiculously high amounts of hurricane/disaster funding to pay off other obligations. The U.S. will NOT bail out long outstanding and unpaid obligations with hurricane relief money. [email protected]: Jay Webber of New Jersey, running for Congress, is doing a great job against a person who is looking to raise Taxes substantially. Jay wants big Tax Cuts and Changes. A Harvard graduate and father of seven, Jay will be great for New Jersey and get the job done-and I will help. [email protected]: Jay Weber of New Jersey, who is running for Congress against a person who wants to do nothing more than raise taxes to the maximum limit, is looking good. A Harvard graduate and the father of seven, Jay wants to substantially reduce taxes, so important for New Jersey-I will help.